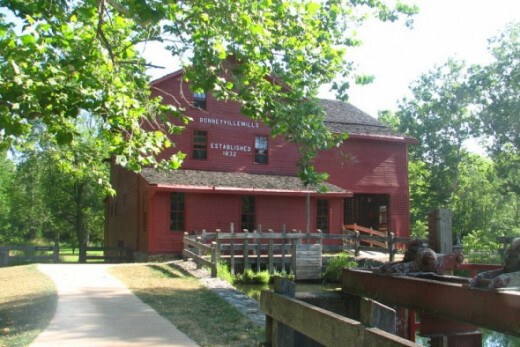 Bonneyville Mill is an antique grist mill in northern Indiana, still in operation today. 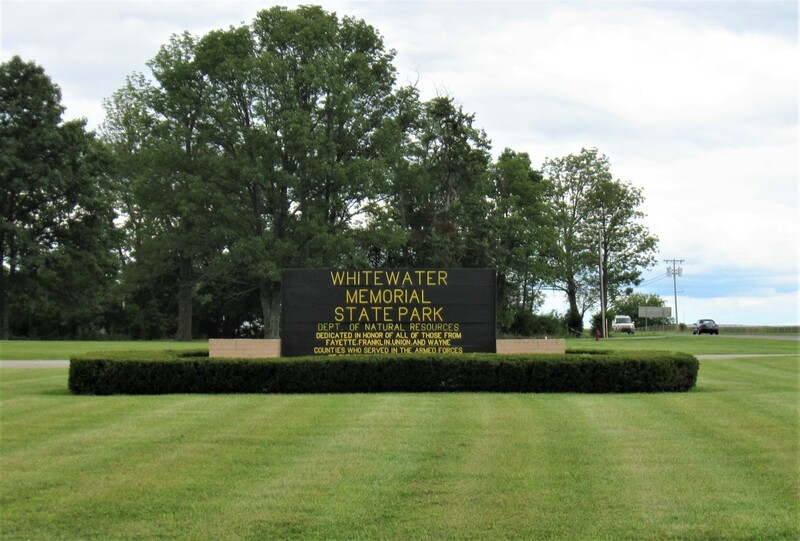 It is the centerpiece of an Elkhart County park. 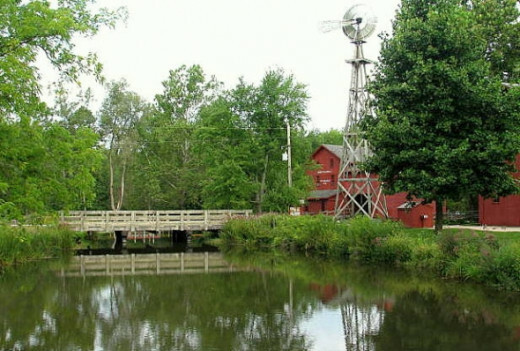 From May through October, the water powered mill grinds local wheat, corn, buckwheat and rye into flour. 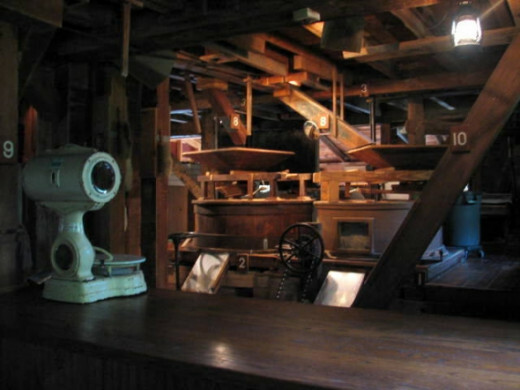 It is fascinating to see this antique flour mill in operation, and you can buy the flour, too. 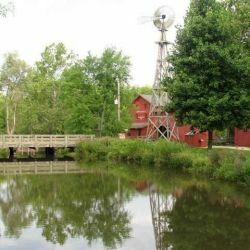 The picture of Bonneyville Mill is just as idyllic as any mill scene from days gone by - a quiet pond reflecting cattails, a blue Midwestern sky and the barn red siding of the mill. 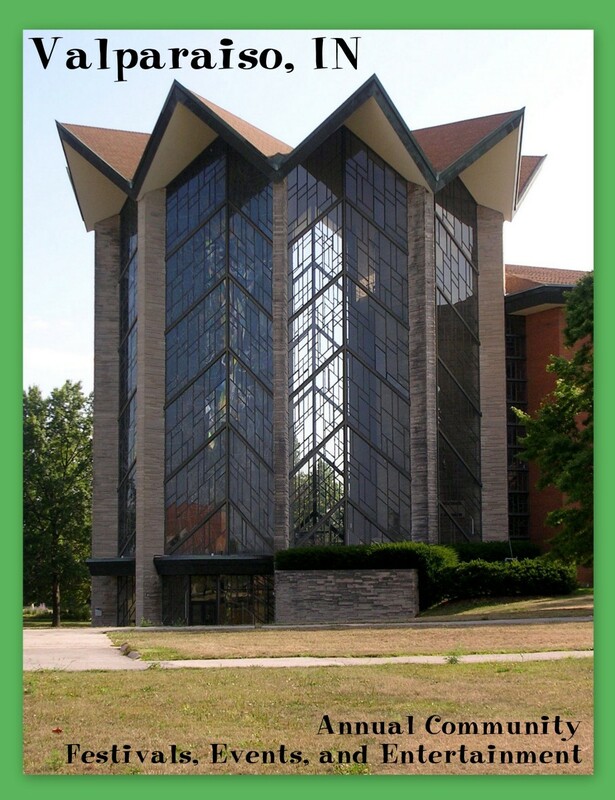 The wheel is horizontal, rather than vertical, so it's not visible outside the building. 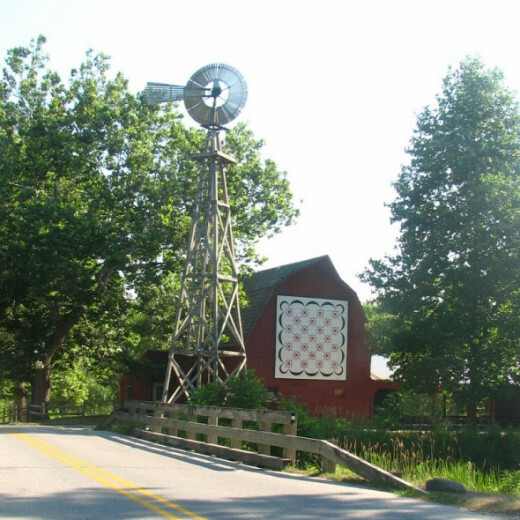 Founded in the 1830s by Edward Bonney, the mill has been stone grinding wheat, corn, rye and buckwheat for more than 150 years. 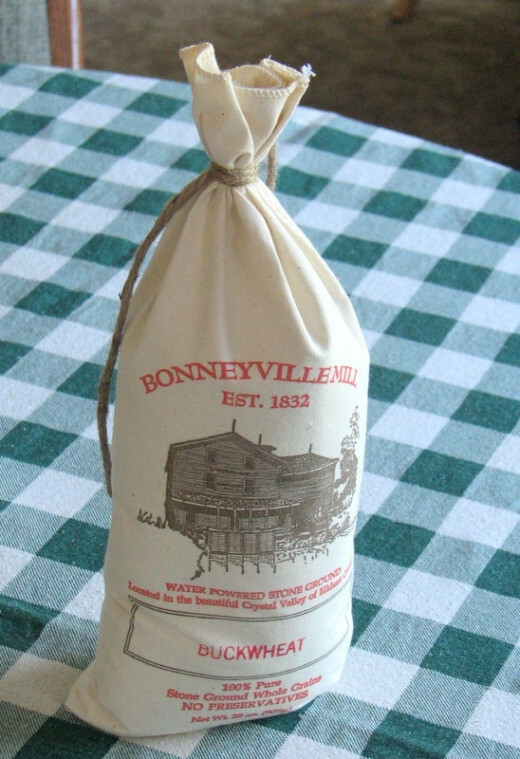 If you've never baked with flour from a local mill, I encourage you to find your own local sources and bake some bread, cookies or other treats. It is a joy to work with quality goods like these. This is a lot more beautiful than the average grocery store. 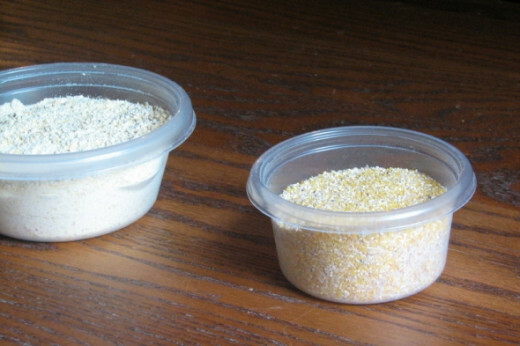 We modern bakers usually head for the local supermarket, where the process of buying flour is a lot less sensory. 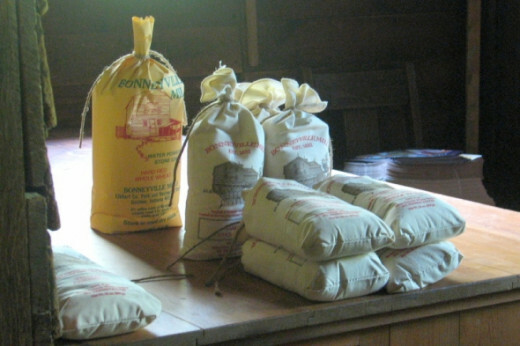 But there are sources of flour in grain-growing parts of the country, even a few where the flour is ground by local mills. I love to stop here when I'm in the area, and buy some flour. The staff has told me that some customers come from more than 100 miles away to buy flour during the season, and freeze it for use during the winter when the mill is not open. 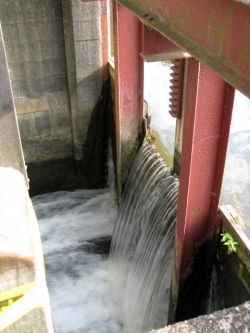 Visitors have to walk around beside the foundation and look down to see the how the rushing water of the Little Elkhart River fuels the mill's horizontal wheel or turbine. 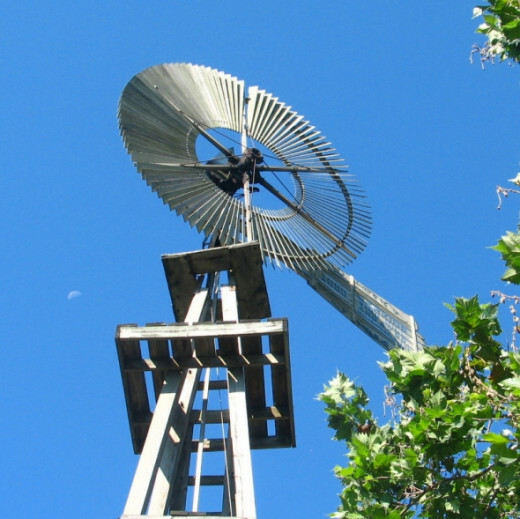 The mill was an innovation in its time, because Bonney installed the works using a horizontal mill wheel, which produces more horsepower than traditional vertical water wheels. Stone milling is considered the best process for grinding grain from a nutritional standpoint, because no other machinery grinds grains into flours, cereals, and meals as well as the massive stones used by millers since the Romans. 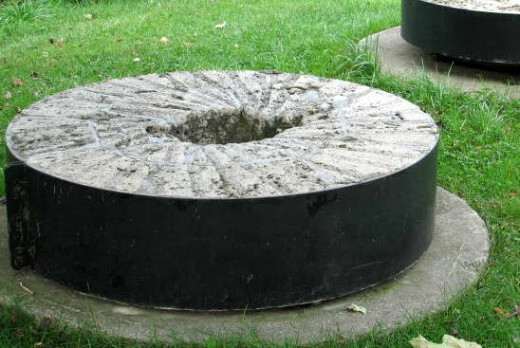 They display these used mill stones outside. It takes some horsepower to move these massive stones, as they grind grain into flour. When the mill is grinding, you can watch this equipment at work and see the finished product fill the bins. 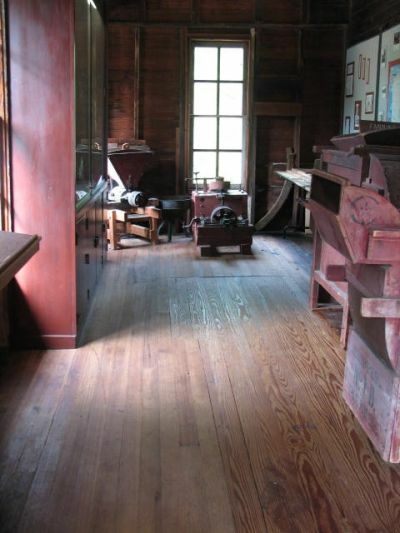 "The mill grinds three kinds of wheat," says miller John Jenney, "two hard and one soft, two kinds of corn - yellow and white - in addition to buckwheat and rye." 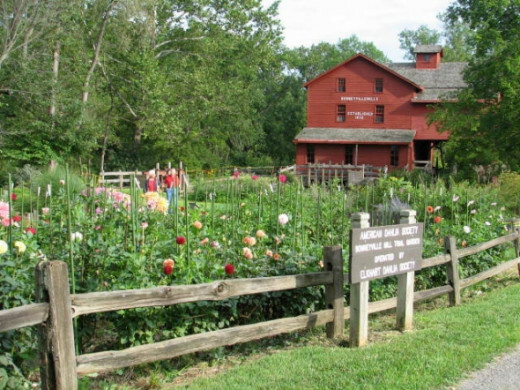 Now listed on the National Register of Historic Places, thousands of visitors each year have the opportunity to see this old-fashioned milling process first hand, and feel the massive grist stones vibrating beneath their feet. 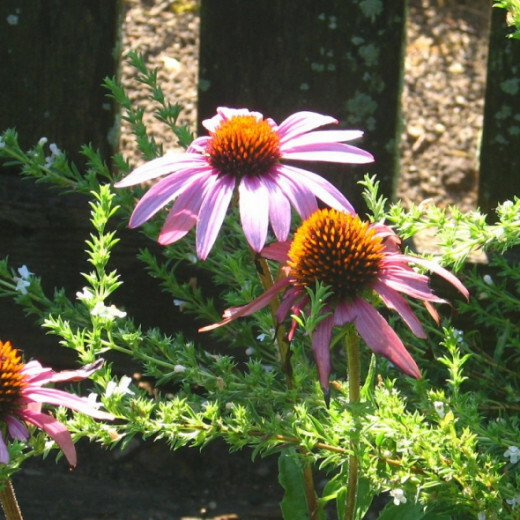 Just past the mill pond, the county Dahlia Society has a test garden, with many beautiful plants that bloom in late summer. 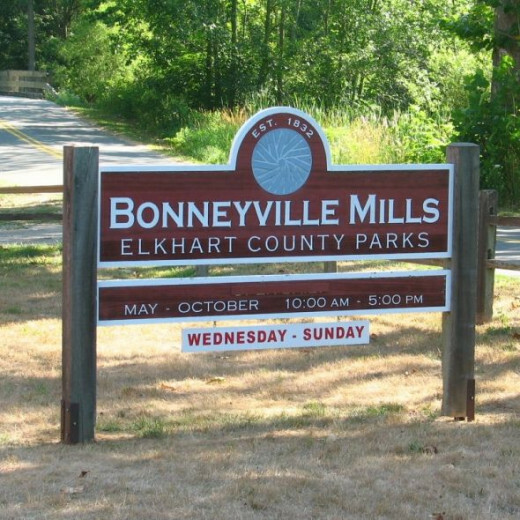 You can find out about the picnic areas, hiking trails and other things to do at Bonneyville Mill County Park via the county parks website. Is This The Vacation Spot For You? - A Quiet Picnic on a Summer Afternoon? Great photos! I would love to visit this mill. I like your description of it as a big, working antique. This looks a fantastic place for a vacation. Thanks for sharing this place with us. Great lens, love the photos. Awesome made lens, great job! Squidlike! I know I would enjoy this place. Maybe someday I'll get over that way. I wish I could see this but our travels do not take us that way. We did see an old abandoned mill in North Carolina that fed my imagination. It would be great to see one actually in use. And the bread made from the flour would be fantastic. It looks so quaint and peaceful. Congratulations on making the front page! This is a very lovely lens. It's nice to see beautiful, historic places like this. Thanks for sharing. 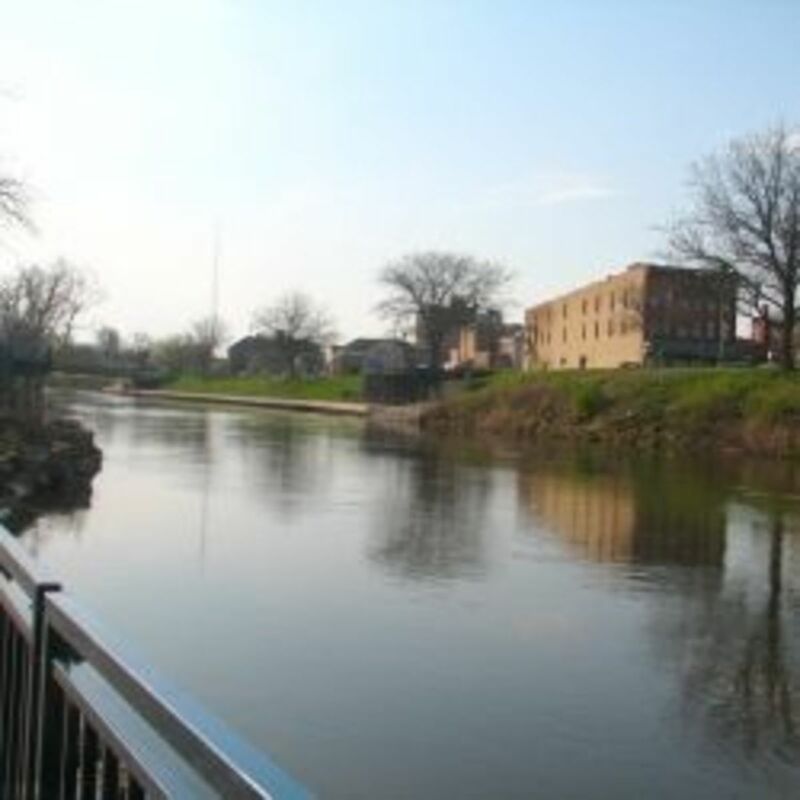 Although it is a bit of a distance from my southern Indiana home, I do travel up north for some jobs, and will be sure to visit the mill should I be in the area. I was just here in May and it is my pleasure to be able to return to congratulate you on front page honors, love this step back in time! Nice lens! 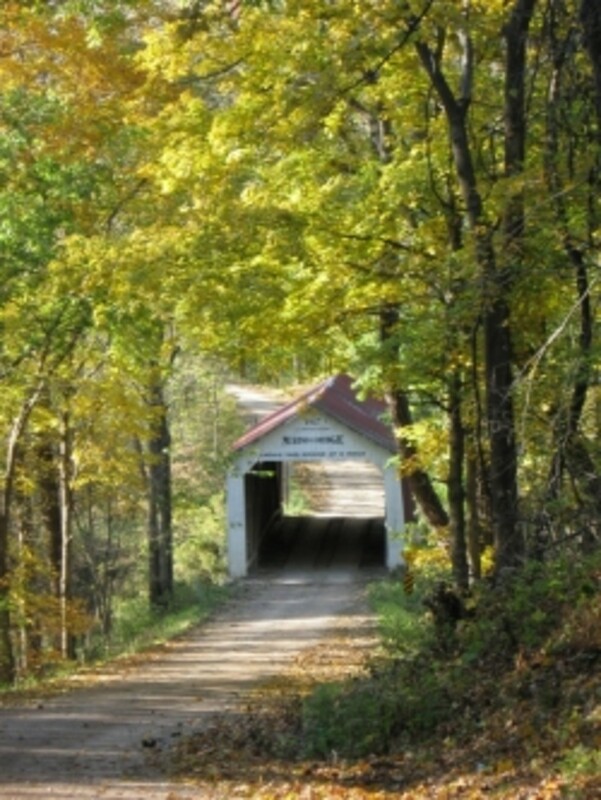 Didn't know about this wonderful place in my own Hoosier state. It's at the opposite end of the state from where I live. Hope to get there sometime. Great lens. I love visiting the old mills. This is my type of place -- quiet and quaint. 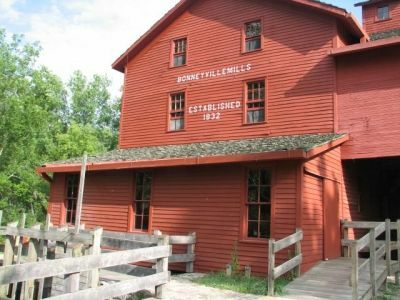 I would love to visit Bonneyville Mill in Bristol, Indiana after reading about it here. Your photos are lovely. Indiana seems like a great place to live and visit. ....and congratulations on your very well deserved purple star to shine here forever...blessings! What a wonderful step back in time to actually be able to visit a functioning grist mill that has been so wonderfully kept up for all to enjoy this historic experience. I imagine that everything you bake with this special flour just tastes a little bit better. Beautifully presented with all your wonderful photos and an obviously fond heart. @TonyPayne: It IS such a small world! Glad you enjoyed this lens. It will be updated with extra photos eventually and I'll promote it on Facebook when I do. This looks wonderful, I wish now I had visited when I lived in the area. I lived in South Bend for 12 years, and worked in Elkhart as well, but only went to Bristol once in all that time. Excellent page, with some lovely photographs. 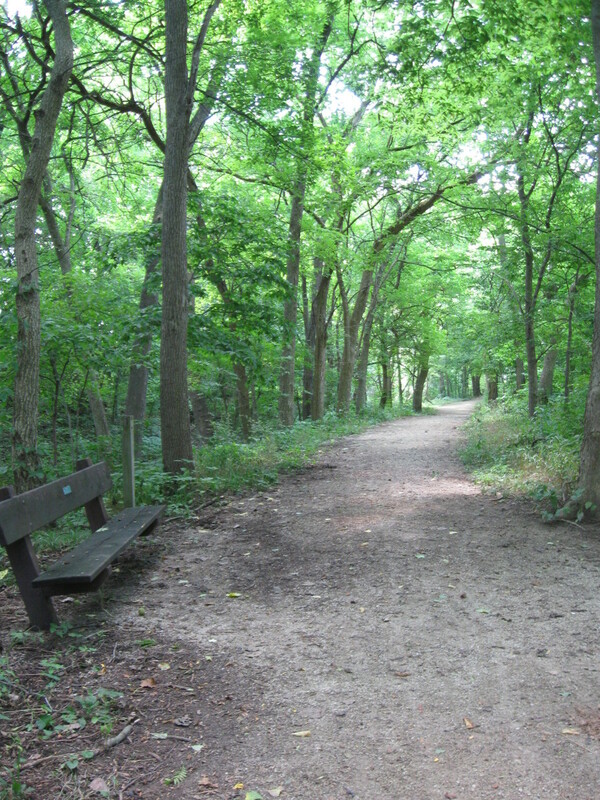 I can well imagine the joy of having a picnic or a quick vacation at such a lovely spot! 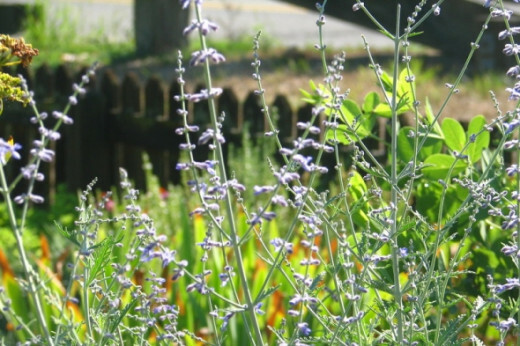 The gardens are incredible. Gorgeous pics here! Looks lovely! Lovely place! It's so great they are preserving it. I really appreciate living history. Thanks for showcasing it! Sounds like a cool place. 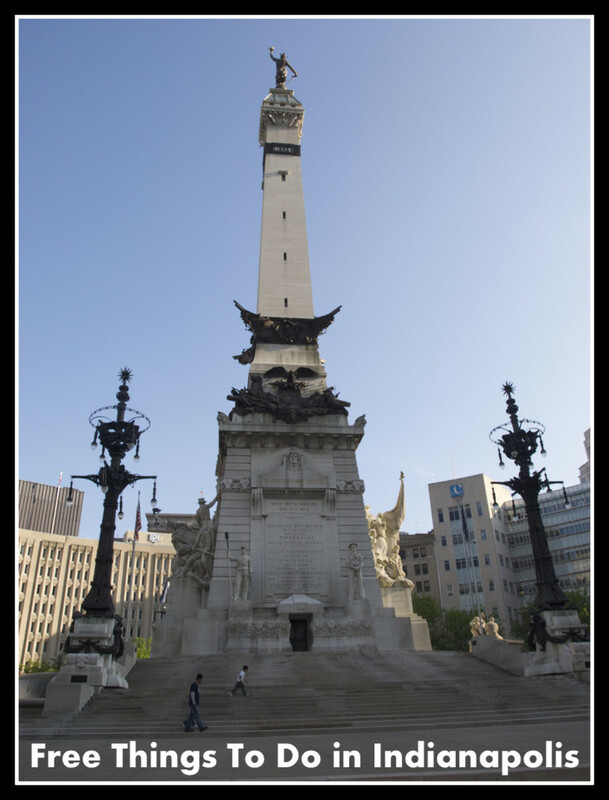 Added to my Articles about Indiana. Our forefathers were so ingenious to create mills of this kind. And you are right...the flours from these places is definitely a cut above the store brands. 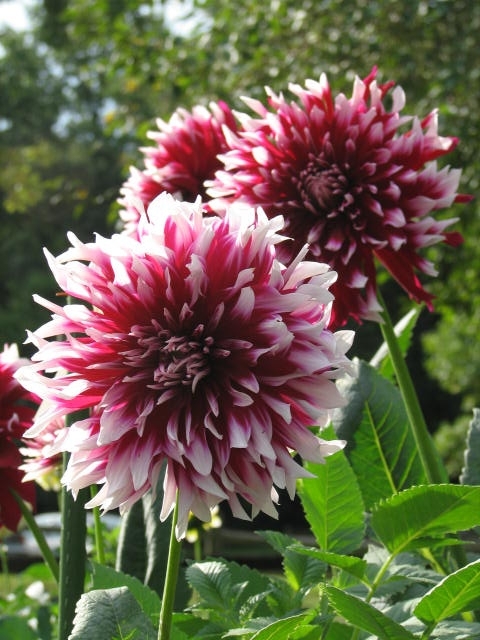 I would like to see the dahlias too. My Dad grew them and they were so beautiful. Very interesting...love your photos. Blessed and added to my United States Angel Travel lens. Not so much a vacation spot but I would like to visit for the Dahlias. That's one flower that I wish I could grow in Central Florida.